Ashton Kutcher will now become a wealthy techie on the big screen. 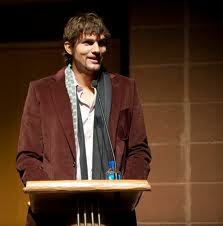 Currently Kutcher plays the role of a very rich techie on the television series Two and a Half Men. In the not so distant future that experience will come in handy as he will play one of the world’s most famous techies in a soon to be produced movie. Kutcher will play the part of the late co-founder of Apple Steve Jobs in Jobs, an indie film. The movie will portray the life of the Apple co-founder through his hippie days to his running of one of the world’s most successful tech companies. The script was written by Matt Whitley and will be directed by Joshua Michael who directed Swing Vote. Kutcher was just offered an extension on his contract with Two and a Half Men and is in the midst of negotiating the deal to remain on the show for next season. The new movie will start filming in May, as that is the time Kutcher is on hiatus from his sitcom on CBS. Jobs was portrayed previously by Noah Wyle the star of ER opposite actor Anthony Michael Hall who played Bill Gates in Pirates of Silicon Valley a TNT movie released in 1999. In October of 2011, Jobs lost his battle with pancreatic cancer at the young age 56. Apple has recently become the world’s largest publically traded company.